Set up a video streaming server. All players will be able to display the video from the streaming server. It can be used to display the real-time TV programs. Display the live video or TV program through a video capture device. The channel of the TV program can also be selected. Display the weather forecast of the selected city which includes the weather icon, temperature, wind direction, etc. Display the present ambient information just like humidity, temperature on the screen by working with a matching sensor. User can set a playlist to display perpetually as well as set the displaying date, time and priority freely. The playlist in different schedule time will be saved on the player as a prestore item. The player will display the playlist according to the schedule automatically. It is easy to realize the display function like the playlist insertion, preparation, etc. User can create several display windows on the screen which can display different playlist separately without interfering each other. It is flexible to switch between each kind of multi-windows solution. Update the letter solo in the subtitle window without affecting the main content. User can send several pieces of letters to the player which will display them repeatedly according to the duration and priority which have been set. It is convenient to send a notification by browser and SMS through mobile phone as well. 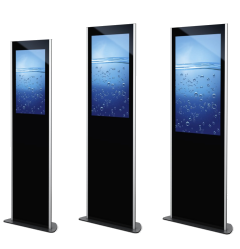 With touch screen module enabled, the user interactive interface is presented on the screen when touched. And it restores to display the playlist automatically when no one is using it. By using synchronous display function, all the players will display the contents synchronously. Professional MS Windows desktop editor software can be used to make the playlist visually as well as auto-generate layout solution by importing the windows template. User also can drag and drop the files from file explorer into the editor directly to create a new display item. Copy and paste is supporting meanwhile. User can preview the contents which have been added in real time. Create a simple content list on web server by browser directly which includes video, picture, text, time and sensor, etc. It supports browser as follows IE, Firefox, Chrome, Safari and Opera, etc. No need of any plug-in. The playlist item made by editor will be exported to generate a playlist package which can be distributed to the players by several ways including uploading to the WEB server or special FTP media server etc. If a player is unable to get online, user can put the programs package under the designated directories of USB disk. The program will be automatically loaded as soon as inserting the USB disk into the player which has installed the player software. Build a region server to transit playlist, where the player can download the playlist through LAN directly. It can effectively reduce the bandwidth use. Players will store the received playlists as well as automatically clean the overdue playlists. By using web server, user can realize the playlist prestored on each player. You can not only delete them manually by remote operation, but also can manage the playlists through the configure dialog of player. Install the player software under the MS Windows system, keeping the PC on line. Then a new player is born. The player will self-register on the server and start to run. Supported system include Windows XP, Windows 7, Windows 10 etc. This displaying system customized before with low memory requirement and preventing the possibility of any man-made destruction can be set to use as soon as it is installed. Specialized embedded computer with smaller size can run more stably and safely. In the case of using LINSN, DBSTAR, NOVA, SANSI, MOONCELL controller, the system provides flexible brightness solutions which can adjust LED luminance automatically according to the external light intensity or regular time. By using our control box, power supply of the player and screen can be switched automatically at the fixed time. The switching time can be reset remotely by internet. Optimized system can cope with 5000 players online at the same time easily, which has proved by a lot of success stories. A detailed play log of contents will be shown on the web server. User can output and print the records at any time. It executes encryption and authentication mechanism in every aspect of the system to guard against any external threats to players. When a fatal error occurs, the player will carry out the auto-restart and recovery operation to ensure that the basic function of remote interview is available. The player can self-connect to the internet by 3G access at the fixed time which can be modified remotely. Automatic checking and adjusting the system time. According to the preset schedule time, the player will adjust the volume automatically. Displaying the fixed station logo picture, digital clock, or weather forecast on some designated area of the window. This information will be shown in the form of hollow-out without influencing displaying contents. Recover from error when hardware or software issue happens. Learn more about the watchdog function. User can download the editor and player software to experience the powerful function. On condition of importing the playlist package with USB disk manually, this system is totally free for use.